*This post contains affiliate links. I may make a commission on my recommendations at no cost to you. I may be a millennial mom, but I very much carry that old school, uphill both ways, rub some dirt on it way of mind. There is no part of me that believes my children need to be constantly entertained by me…or by anything for that matter. A certain amount of boredom creates charector. While I had older siblings and a younger brother, the truth is, I spent most of my time by myself. My parents never felt the need to constantly entertain me and I think it is one of the best things they ever did for me. That’s why when it comes to road trip ideas for kids I have certain low standards I like to stick with. Windows are entertainment – You know how much time I spent looking out windows as a kid? A lot. I loved those quiet moments to myself. Too often today we get lost in screens and fake images. I much prefer the real thing for me and my kids. Which brings me to my next point. Getting lost in a screen is not what I want (for us or our kids) – If you are hoping to avoid tantrums and meltdowns in the car, then I say the more screen-free road trip ideas the better. Too much screen time has a way of making anyone cranky especially when you’re cooped up in a car with nowhere to go. 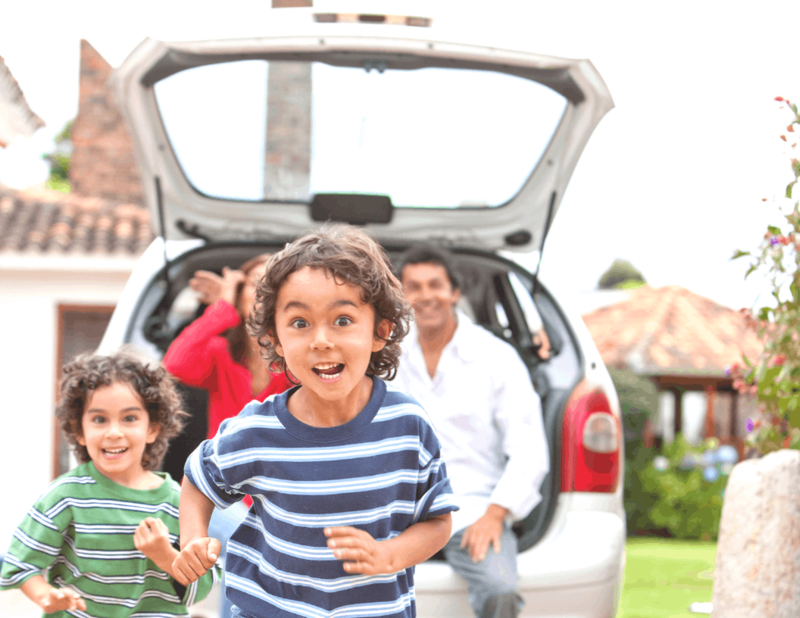 Road trips are family time – Trust me, I enjoy time away from my kids as much as the next guy, but usually, when we are on a road trip it’s because we are working toward some serious family time together. I would like to think that family time doesn’t have to wait until we get to our final destination. Instead of shoving everyone’s faces into screens, take advantage of this extra time together…while still getting quiet time for yourself! Car crafts and printouts are a waste – As I said, I’ve tried to create fun entertainment ideas for the car. They never lasted and they always made a mess. Which meant I inevitably wasted time and money and there was no reward what-so-ever. I did, however, learn from my mistakes. Our road trip ideas for kids no longer include any of this nonsense. I’m writing this post because when this post goes live we will be smack-dab in the middle of our road trip adventure from Minnesota to Wyoming and then from Wyoming to California. This trip is just shy of 2,000 miles and gives us a grand total of 26 hours in the car! –Don’t forget our ride home from Cali to Vegas to Vail, CO and then home again! Yup, 52 hours in the car together and 5 total stops. Make sure you’re following along on Instagram and YouTube because I’ll be doing my best to document and share the whole trip! Have we tried screen-free road trips before? This California road trip is a trip we took once before too. When our little ones were even littler…like 2 and 3 little. So trust me, when I say these tips work…then you’d better believe it sister…brother…whatever you are. Not only have we made the 2,000 mile trek to Cali, but we also take those frequent 6-7 hour drives to Michigan just like I did when I was a kid. Plus, when the kids were young we would make a 2.5 hour drive every month to see my grandma and then we’d come home that same day! Five total hours in the car, totally screen-free. So yes, I believe screen-free is possible. My kids are living proof. There is something so exciting and adventurous about hitting the road in the middle of the night. It can make kids feel crazy excited, like what they are about to partake in is totally magical and life-changing. Play into this, folks. Make getting in the car (no matter what time of day) a super exciting event. But, remember, taking advantage of the dark hours of the day or night just might help get you some extra sleeping hours during your trip! Nothing beats a good game of Ispy right? Except on a road trip, the rules kind of reverse. Since you’re speeding by everything so fast, you don’t really have time to spy something and then let everyone search for it. Instead, pick a color, object, letter or structure and let everyone else try to spy first. For example, I might say, “Ispy the letter X.” Now everyone in the car can be on the lookout for the letter “X” and the first one to spy that letter (on a billboard, building or license plate) wins that round. When my kids were little this was not something we included on our road trip. However, now that the younger ones are 7 and 8, I have been prepping and planning with them. This time they will each get their own map and marker and will get to track our trip as we go! Creating something like this is a great hands-on way to get them engaged, teach them how to read maps, and only requires a quick Google search and a click of the “print” button. So this one might not be anything new, but let’s not forget the power of books. Take your kids to the library or the store and let them pick out a brand-new, never read book. I always require them to pick one that challenges them. AKA something they might have to look at longer than 2 minutes. Getting a new item set aside specifically for use in the car is a fun way to make them excited about the trip and their new book. If you can have screen time, you can have window time gosh darnit. Set a timer on your phone for 20 minutes of totally quiet window time. This is a great idea when driving through a busy, lit up city at night or when you have gorgeous scenery all around. Another quick trip to the library, you could easily find some books on tape for the whole family. Better yet, see if your library has an app! I recently discovered that our local library has an app where we can easily download eBooks and audiobooks at the click of a button! I plan on getting a few audiobooks lined up on the kid’s iPods (AKA Tom and I’s old iPods) so they have stories they can listen to instead of having to work on reading. Then they each get quiet time to themselves and so do mom and dad! For Tom and I, I downloaded the 30 day free trial of Audible. With our free trial, we downloaded Chris Hogan’s latest book Everyday Millionaires. This way, while the kids listen to their library audiobooks, Tom and I have one to listen to as well that will sync up with the BlueTooth in our car. There is always good old fashioned books and good old fashioned coloring books. The total cost of this project is easily $2 per kid at your local dollar store. I don’t know about your kids, but mine are basically bottomless pits that still haven’t made it past the 50-pound mark. I don’t get it. In order to keep demands at bay and restlessness a thing of the past, I make sure to prep snacks ahead of time. Other moms might be printing road trip Bingo and I’m hitting up Aldi for all the best and cheapest snacks available because hangry is a real thing, people. I’m all about using over-the-seat car organizers for keeping snacks organized and easy to reach for the kiddos. Here are some awesome organizers. Everyone is going to need to stretch their legs. Don’t deny them this right. If you have to stop every hour or two just to stretch on the side of the road. Do it. It might feel like a huge inconvenience when you’re trying to race the GPS, but it will ultimately pay off when you don’t have a meltdown happening in the back seat from kids who have been strapped in too long. Ok, I know this is supposed to be screen-free road trip ideas for kids BUT, let’s be honest. We live in a digital world. While we no longer have movie screens in our car. (This is an argument I fought until I was blue in the face) we do have pre-planned games available on the iPad. Like I said, keeping screen time limited is crucial for anyone so if you are going to do screen time, keep it limited to 20 or 30 minutes and then encourage a long break in between. One of the best things you can do for your kids and your family as a whole is to shut off the music, pause the audiobooks, power down the screens and just talk to each other. Your kids are probably full of questions and in the busy hustle and bustle of everyday life, a lot of those questions go unanswered. People often wonder how in the world I manage to homeschool our kids when in reality, a good chunk of homeschooling is just intentionally answering as many of their questions in a day as I possibly can. Taking 20 or 30 minutes just to allow your kids to ask you questions about the trip, the road, the world or…anything just might surprise you. They will love learning from you and doing this just helps keep them engaged in their environment every day. Ok, that was a good mom speech up there, wasn’t it? Answer all their questions. Encourage learning. Yay. Now it’s time to talk sleep deprivation. If you are planning to leave late at night or early morning, I say, do your best to keep those kids up past bedtime! Sure there might be a little fuss-time in the car until they finally surrender to the nap, but it will be worth it if you can sneak in a 3-hour nap! WARNING: DO NOT ALLOW NAPS UNTIL AFTER YOUR CHILDREN HAVE BEEN FED AND EMPTIED (POTTY BREAK.) THIS WILL ENSURE A LONGER, CALMER NAP TIME FOR EVERYONE. There is nothing wrong with letting your kids make their own little nook in your car. Let them bring a blanket, pillow, stuffed animal (or all three) so they can make themselves at home. This is especially important if they have siblings riding along side them. Having their own personal touch can make them feel like they still have their own space when they start to feel a little sick of all the closeness. Talk about your trip ahead of time and maybe lay out a few options for stopping along the way. If your kids are old enough, let them help plan the stops. Maybe that’s a quick lunch at McDonald’s or an hour break at the World’s Largest Ball of Mud. The more involved they are, the more likely they are to stick with you through the trip. Older kids: When they are allowed to plan a stop, they can also keep track of how far they are from their destination on their maps. Sure kids can take 800 pictures in under 1 minute with most smart devices these days. But giving them an old fashioned disposable camera encourages them to slow down and think out their photos. More than likely they aren’t going to want to waste 25 precious pictures on silly-faced selfies. Instead, maybe they’ll really look at that gorgeous tree in the park, or quietly sneak up on the squirrel on the sidewalk. Not being able to see their work until the end of the trip is also a great way of still giving them something to look forward to as you make your way back home. Didn’t even know disposable cameras still existed? Leave it to Amazon!! Get your disposable cameras here! If your kids do have their own electronic device that they can take video on, encourage them to document their trip! This can be such a fun way of seeing the trip through their eyes, keep them entertained on the road, and will be a great keepsake for the future. This is one I stole from Pinterest…or somewhere…during our first road trip to California. I took 3 clothes pins (one for each kid) and decorated each of them to be unique with each child’s first initial. If these clips stayed in place during the road trip, our kids would get to choose a treat during our next gas station stop. If they misbehaved, their clip got taken down and they missed out on their snack. Plan potty breaks and other stops. SERIOUSLY. Check your map ahead of time to make sure you get in potty breaks before it’s too late. We may or may not have had to help my son poop on the side of the road in Wyoming due to lack of planning. Not my finest moment. Also, if you know the trip is going to be too long and you’re going to want to break it up by staying in a hotel for a night. Plan your hotel in advance. During our trip home from California last time, we decided to be spontaneous and just stop when we felt like stopping. Well, we felt like stopping in Utah and the entire state decided to be booked up for some baseball tournament. Trust me, spending too long in the car with your kids…and no way to escape is a sure-fire way to make sure you will all turn on each other. Similar to the clothespin visor rewards, you can pay your kids for their silence. I wish there was some other less mobster way of saying it, but there isn’t. Make deals with your kids, if they can be quiet for 30 minutes of “window time” then they’ll earn a dollar. If they make it the whole trip without fighting, they earn $5. This strategy not only helps keep peace in the car but will give them some spending money when you get to your final destination so they aren’t always begging you for cash. One rule of thumb is to always allow music if you have it available. Let your kids take advantage of listening to their favorite songs with their headphones on…but make a no singing rule. That sounds like torture. No matter what, if you are embarking on a long journey with little ones, you’d best prepare yourself for some bumps in the road. Literally and figuratively. You can take advantage of all of these screen-free road trip ideas for kids and they will still find a way to have a meltdown. If you can get your mindset right, that alone can make the trip a bigger success than if you allow yourself to get sucked into their tantrums. Any other tips that I missed? Feel free to share in the comments!